This week, clients invited us over to show off the finished product. The landscaping was finally in. The furniture was finally in. They were very happy with our work, and explained how design has changed their life, down to their morning ritual... Where homework is done, where the dog sleeps, where the mind is taken off the day. My client joked "this is my first real adult house...at age 50." From the beginning: the dream of sitting on a Corbu chair listening to a water fountain. This room now gets used by all members of the family, including the dog! Dog Buddha. "He's an inside dog." My camera is sadly not wide enough to capture the entirety of the project. Hopefully we will hire a professional to take pictures of it soon! It's been a while, sorry about that. Time flies when my conscious and unconscious mind piles projects, causes and events into heaps. I'm just starting to get out of it. First and foremost, I have a Patreon. Opening an account, writing on my motivations and hopeful outcomes, adding the URL on my business card, and sharing the link in social media has been my official "introduction" into the art world, with me drawing more consistently and lovingly. After the holidays, I finished two competition entries and one art-related application. We're one for three, but this means more production: I'll be tabling at Exterminator City, a comic and art mini-fest at Push/Pull Gallery. One of the prints I'll be selling at the fest. First time I sell prints! I also humbly attended Advocacy Day for Affordable Housing and Homelessness at Olympia, representing the 43rd district. It's something that I deeply care about, and was very happy to have a boss that thought of me first with this event. We both went and though we took a passive role, we absorbed as much as we could for the next fight. There are a few bills in the pipes on affordable housing. One of them is HB 1565, which outlaws source of income discrimination, such as Section 8 vouchers and other government subsidies. This sort of discrimination happens quite blatantly. Advocates also reminded their legislators to continue support for the Housing Trust Fund and programs such as HEN, ABD, and SSI Facilitation services. In Seattle, HALA is the housing affordability giant getting attacked and praised from all sides. My next steps with advocacy is joining a community organization (begun by the Capitol Hill Eco District crowd) representing neighborhood renters, as we feel the conversation so far has revolved around property owners, and not around majority of residents: renters. March holds emptiness, but not for long. I'm hoping to get selected to be part of the HALA Community Focus Group for my neighborhood. There's also comics to submit for one anthology or two, as well as other mini projects cropping up like flies. For architecture, I am managing two house remodels, plus all my other responsibilities as architectural staff. 2016 has been treating me well. Still drawing little houses. I want to make this zine for this year! Lately I've been drawing small houses. One of them is in Revit. Many of them are sketched in thumbnail in little bedside notebooks . One, which I scanned below, drawn in the woods while fantasizing about plywood boxes in glass boxes in the wilderness. Houzz, Pintrest, and Architizer beckon me with beautiful sun-drenched tiny homes, delicately crafted and designed to fit in the back where a garage can be. The promise of humility, simplicity and quality- In drawing these little thumbnails I think: what do I really need? Why do I need it? What can I do without? What habits can I change? More plywood boxes in glass boxes later. "I've Got a Friend in Alaska.." will be a small book with my tiny house designs I have sketched out while thinking about that small plot of land my friend promises "I can do anything." One of our buildings had it's opening "festival" - bands, food, beer, and even an opera singer. The day before I bought a new sketchbook to take with me while camping (size, teeth- all matters) - to mark the occasion, I drew a little cartoon of our project. The easement is more open and less scary. The party took place last Thursday. It's very pleasing to see real bodies in the space rather than photoshop phantoms one cuts out to "activate" a project- to give it life, to give it function. Left: the mews, picture by my coworker Wing-Yee. Right: the courtyard, filling up with people! The old bones it the lot behind the Chophouse- turned into an active, multi-leveled courtyard. I think we're done! 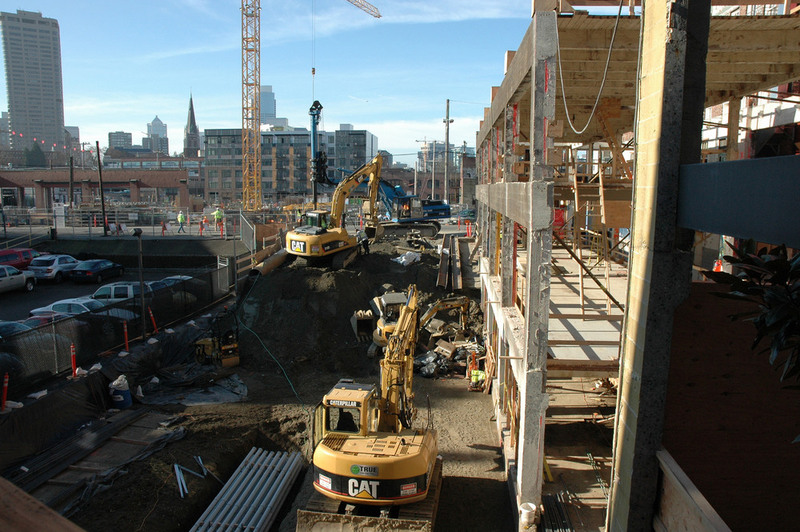 TI work is being done by our friends Graham Baba Architects in Capitol Hill. Don't be surprised if I use this building as a background to my comics. It's engaging, unique, and full of history. Another SKL adaptive reuse project. I worked on this lately for late DDs to CDs, as well as design review documents. We love this project as it sits in the heart of the Pike/Pine corridor. New construction has definitely been perceived in a negative light by the populace: once complete, they are expensive, usually remove much-loved brick-clad buildings of a previous age, and then showcase tenants who charge $12 for tacos or $4 for coffee. Chophouse Row during the summer. The Chophouse is the concrete shell on the right. We reused the structure for the first three levels of the building. A season or so later, the new portion abuts to the old structure, supporting it. It's incredible how much difference floor to ceiling glazing does to a space. The city feels like it's just outside, part of your office or living room. The mezzanine levels have double height spaces given to offices in both levels.